A resort style bedroom design with dedicated 860sqft of space. Combination of bedchamber, walk-in wardrobe, bathroom and outdoor garden. With the element of nature; timber and greens bringing relaxation to our everyday life, especially when back from the hectic working routine. Nothing much unnecessary objects in the sleeping room except of a comfortable perfect mattress, a relaxing lounge chair and a few couple of warm lights. A big storage of walk-in wardrobe, an island for all accessories, yet, the interesting part in the space is the sky light that draw beautiful sunshine into the room from top. 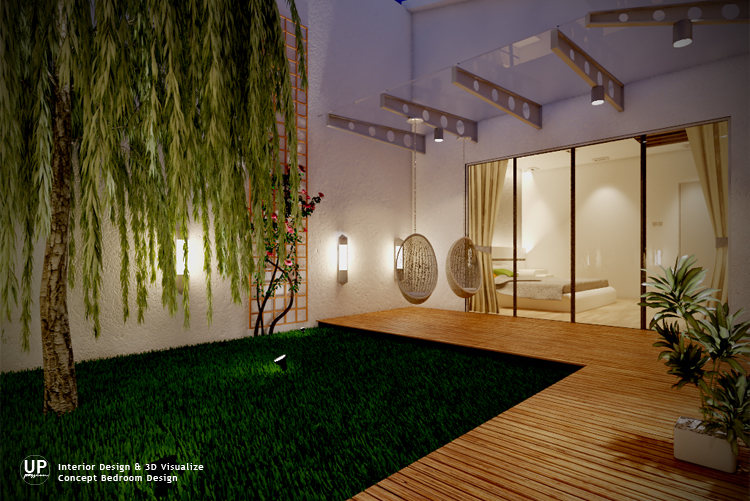 Right beside bedroom and corridor of wardrobe, the outdoor garden is the spiritual nature touch from entire design. Space creation, interior design & perspective visual by UP creations.